Consider me a film guinea pig - I'll pick through some of the more obscure, under-the-radar releases as well as mainstream titles to find what I like. In his still formative years between The Brood and Videodrome, David Cronenberg directed the first of the Scanners films that have spawn several cheap (and often direct-to-video) offshoots. These tales of people possessing powerful telepathic and telekinetic abilities have resulted in five films in all. While the original was far from Croenberg's best work (among other issues, it suffered from a woeful lead performance by Stephen Lack, who couldn't keep up opposite the powerful Michael Ironside), it still set the bar for the Scanner family of films. After producing a few of the sequels that were directed by Christian Dugay, Pierre David decided to take the helm himself for Scanner Cop and it's follow-up. Sam Staziak witnesses the mental instability that has fallen his scanner father, who is killed in a confrontation with the police. One of the officers, Peter Harrigan (Richard Grove), befriends the orphan and in what appears to be an all too easy and convenient manner, arranges for he and his wife to adopt the youngster. Fast forward 15 years and Sam (now played by Daniel Quinn) is not only graduating as an officer himself but finds his foster dad as the police commander. Both have their hands full as some otherwise normal citizens go on a murderous rampage against men in blue. A demented genius (the late Richard Lynch) has found a way to program people to see their worst enemies and fears when they see a police officer approaching them. While Lynch is kinda fun as the heavy, Scanner Cop doesn't feature a showdown between waring opposite factions as much as it is a race against time for the title character - the longer he goes without the meds that help turn off the powers he possesses, the more a chance he will devolve into the insanity that overtook his father. Unfortunately, Daniel Quinn just isn't a strong enough performer to convey the desperation his character is dealing with. Scanner Cop isn't a mess...it's just under-cooked. The acting is too pedestrian, the special effects are cheap without being fun or imaginative (and not enough exploding heads, for sure), the plot developments are predictable, the villains are nasty but not menacing enough, and the levels of violence waffle between being gory and strangely reserved. Best I can say is that the film is well-paced but you can find other movies of this direct-to-video era that are worth one's time far more than this. 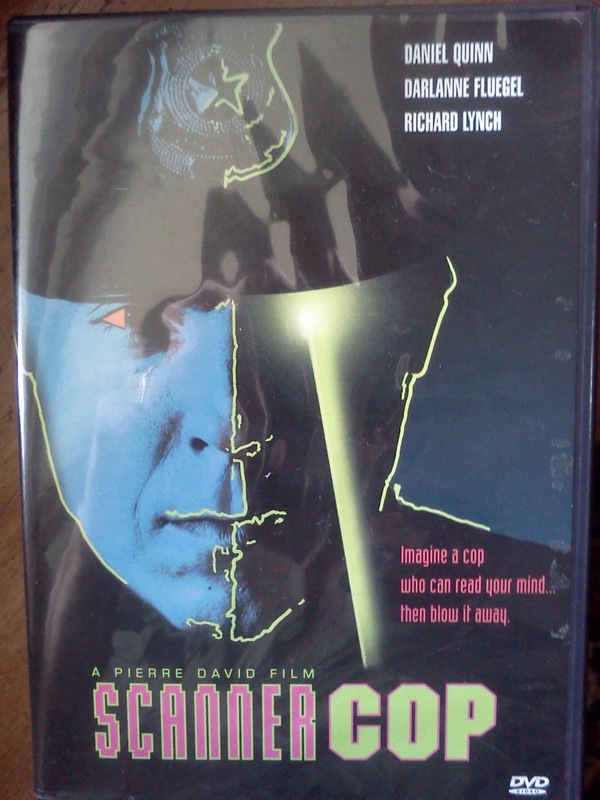 Based on this work, I'm not inspired to view the sequel, Scanner Cop II (aka Scanners: The Showdown). I say this film tastes - UNDER-COOKED. Relax, it's friendly here. She really just wants you to check out the best of the blog films listed below. BOUTIQUE INDIE - better fed budget-wise and closer to mainstream but far from "selling out"
Have A Favorite "Neglected" Film? Even Better Than The Real Thing...NOT!!! Text © Michael Rajnovic (2015-2018) Images/clips used for reviews are copyright © respective owners. Travel theme. Powered by Blogger.